I love this time of year, when the weather starts getting cooler and fall produce starts appearing. One of my favorite activities during the fall is baking. The smell of nutmeg, cinnamon and all spice are wonderful. In my post yesterday, I did a step-by-step of how to make pureed pumpkin. 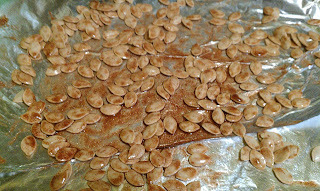 The other great thing to make with pumpkins, besides the yummy puree are roasted pumpkin seeds. They are very easy and a variety of spices can be added to them. Toss seeds in the spice mix and place into a 325 degree oven for approximately 25 minutes. You will want to stir and check on the progress at 10 minutes and every 5 minutes there after to prevent burning. The drier your seeds are to start the less time they will take in the oven. You seeds will look something like the picture below before going in the oven. If you prefer traditional roasted pumpkin seeds the only ingredients you need are sea salt and oil or butter. If you are watching your fat or cholesterol you could also use cooking spray to coat the seeds. I have read of people soaking the seeds in apple juice or sugar water for a sweeter flavor or salt water overnight for a more savory flavor. I haven't personally tried either of these methods, but they sound yummy! That's it, it's that simple. Pumpkin seeds are a great snack and very easy to make. Plus, it's a great recipe to have the kids help out with in the kitchen. My five-year-old got a kick out of making the pumpkin puree and roasted pumpkin seeds this year. @Laura My mom used to make them growing up also, they were yummy :) I eat them sunflower seeds also! Interesting recipe! I have had pumpkin boiled and in soup but I did not know about roasted pumpkin seeds. Take care. I'm a new GFC, FB and Twitter follower coming from the Finding New Friends Blog Hop. I'd love it if you stopped by some time! Hi, I'm your newest follower from this weekend's blog hop. I am right there with ya...I LOVE this time of year! I am going to have to make some of these this year for my girls because they LOVE seeds of all kinds. Following from the FNF Blog Hop! Also going to be following you on Twitter and liking you on FB. I want some! Can you just ship them to me?..hee hee. I like all of the spices you added, and I'm getting very excited for pumpkin season, especially pumpkin pie(with real whipped cream), my absolute favorite thing at Thanksgiving. Can't wait to try this recipe!!! I've never added cinnamon before. @Billie I love pumpkin seeds too :) Followed you back! @Ashley Fall is definitely my favorite time of year :) Followed you back! @Becca I love pretty much anything with pumpkin also! Followed you back! @Ama My two boys love these pumpkin seeds, I hope your children do also! Followed you back! @Good They are yummy, hope you like them! @Michorose They are yummy with cinnamon, I hope you like them! Yay for pumpkin season! Love the photos. Thank you for linking this to Foodie Friday! @Not Thanks :) Have a great weekend!